Girl with Skates designed by Allan Therkelsen. You can almost hear the laughter and joyous voices in Copenhagen’s main square on this year’s Christmas platter. It is a cold winter so there is an ice skating rink in Kongens Nytorv, the King’s New Square. The young girl with her bike is on her way there, but first she enjoys the view. The Royal Theatre towers up proudly, while next door’s department store, Magasin glitters with thousands of Christmas lights. 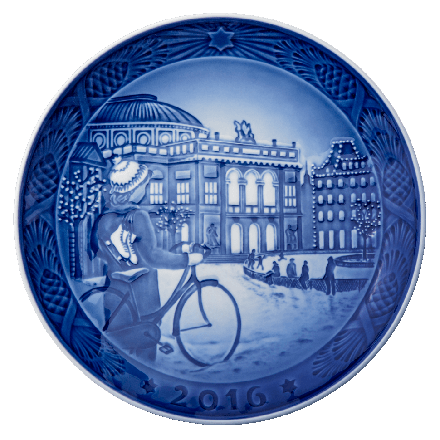 This year’s Christmas plate, the figurine, bell, drop and cup are designed by the artist Allan Therkelsen. First year of issue 1908.